Hidetools Parental Control is the best way to protect your child against any type of online threats. 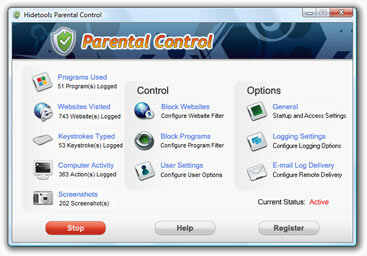 Parental Control is computer monitoring software with powerful application and website filter. Also the program has additional blocking and filtering features such us chat blocking, search engine filtering, social network blocking and more. The program records all what your children are doing on the computer and brings you the reports via email. ...... Tracking is absolutely invisible and includes programs, websites, keystrokes, screenshots and other computer activity. Our parental control software allows you to block specific applications, such us web browsers, instant messengers, games. Hidetools Parental Control helps you to make the internet and computer safety and useful for your children! Parental Control tracks all visited website addresses (URLs) along with website titles and time/date of a visit. The program is compatible with all versions of the following browsers: Internet Explorer, Firefox, Opera, Chome, and more. Parental Control records every keystroke typed on your child's computer along with the application title and the time. Qweas is providing links to Hidetools Parental Control 6.9.7 as a courtesy, and makes no representations regarding Hidetools Parental Control or any other applications or any information related thereto. Any questions, complaints or claims regarding this application Hidetools Parental Control 6.9.7 must be directed to the appropriate software vendor. You may click the publisher link of Hidetools Parental Control on the top of this page to get more details about the vendor.